As we approach Great Lent, let us remember that alms giving is an essential aspect of any effective fast. Alms are beneficial to the recipient and, at the same time, given in love, alms benefit the giver. The giver experiences the joy of sharing what he has been given with the one who is in need, and likewise, exercises good stewardship over the material things with which God has blessed the giver. Alms given in love can be an antidote to the sins of avarice, materialism, and selfishness which so permeate our culture today. To assist all of us this Great Lent, and to recommend a cause worthy of our support (one which we can be assured of its good stewardship and which is also an activity of our diocese), I commend to you St. Nektarios Medical Center in northern Uganda. This medical facility, under the authority of the local Ugandan bishop, is located in one of the country’s poorest areas. Fr. Joseph Ciarciaglino has advised that malaria and intestinal worms are pandemic. Patients have presented with all types of diseases including TB, AIDS (introduced into the area by rebels who used sexual assault as a weapon of terror), and even leprosy. Since the clinic is now treating inpatients, staff quarters must also be built. You can also find further information at www.ugandaclinic.org. 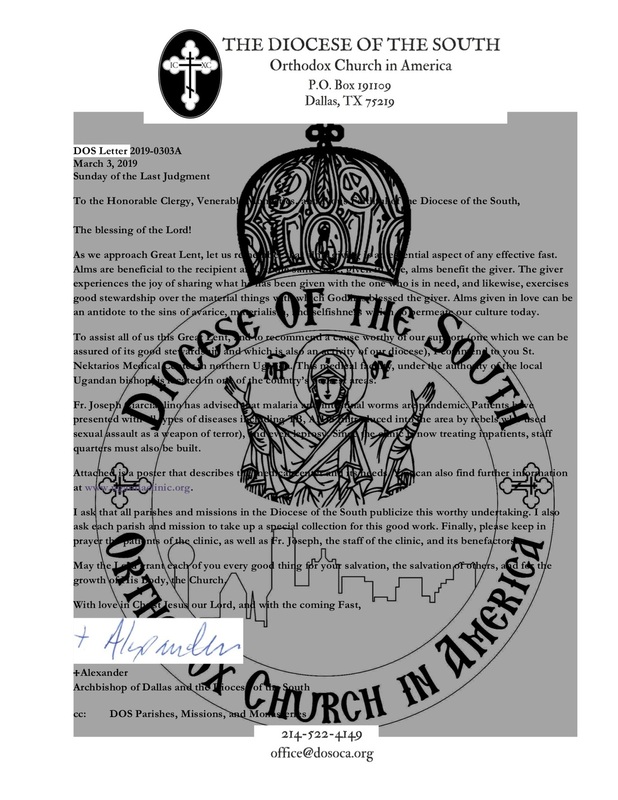 I ask that all parishes and missions in the Diocese of the South publicize this worthy undertaking. I also ask each parish and mission to take up a special collection for this good work. Finally, please keep in prayer the patients of the clinic, as well as Fr. Joseph, the staff of the clinic, and its benefactors. May the Lord grant each of you every good thing for your salvation, the salvation of others, and for the growth of His Body, the Church.